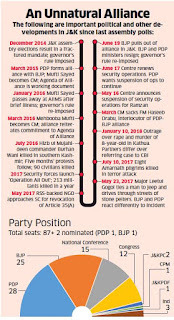 The rocky three-year alliance between PDP and BJP that propped up the Mehbooba Mufti government in Jammu and Kashmir came to an abrupt end with the saffron party announcing withdrawal of support, a move that came two days after the Centre declared that it is revoking the suspension of operations in the border state. 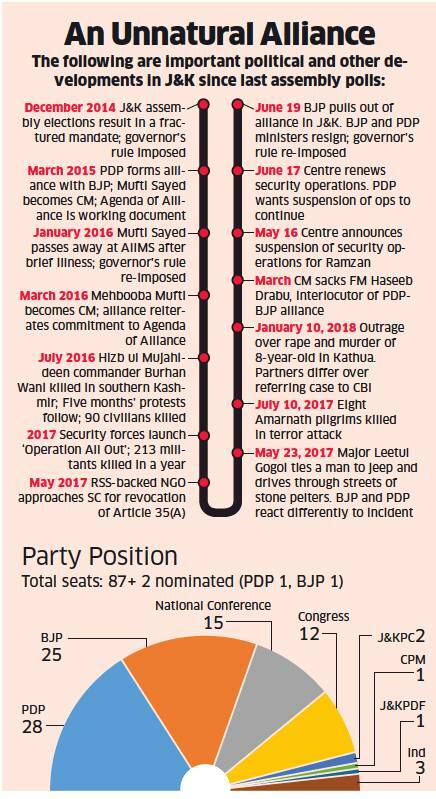 There was simmering discontent on both sides over the alliance as PDP and BJP found themselves on a different page on virtually every major issue. The two parties even spoke in different voices in the Jammu and Kashmir Assembly. While it was speculated for a long time that the alliance will not last long, the announcement on Tuesday afternoon took many by surprise. 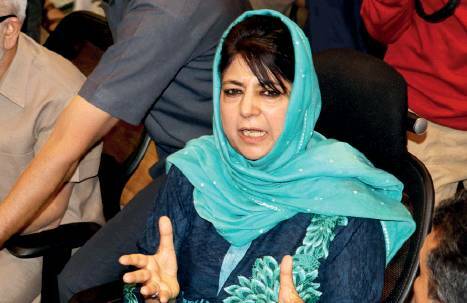 The call was made after a meeting convened by Shah at the BJP headquarters on Tuesday morning with party ministers from J&K, office-bearers from the state and central in-charges handling the affairs of the state. The immediate provocation was not clear but the decision has been taken with an eye on the 2019 elections. BJP was losing ground in the Jammu region due to the alliance and its cadre as well as the RSS were of the view that ties should be snapped. The differences over suspension of operations –– PDP wanted it to continue while the Centre decided to revoke it a day after Eid –– is said to be the tipping point. The month-long suspension of operations tested the patience of the Centre as terror attacks continued unabated. Government informers and security forces were eliminated by terrorists while the forces stayed in the barracks. Sources said the increase in terror activities in the Valley and growing radicalisation of youth was the one of the primary reasons. Mufti was in favour of talks with Pakistan while BJP felt the only way out was to take strong action against terrorists and stone-pelters. The RSS-BJP meeting at Surajkund last week had also discussed the situation in Kashmir. Prime Minister Narendra Modi and BJP Chief Amit Shah were apprised of the issue. The RSS and BJP cadre in both Jammu and the rest of the country were of the opinion that relations with PDP had reached breaking point. The Kashmir discourse has resonance for BJP in the rest of the country and is not just confined to the border state.